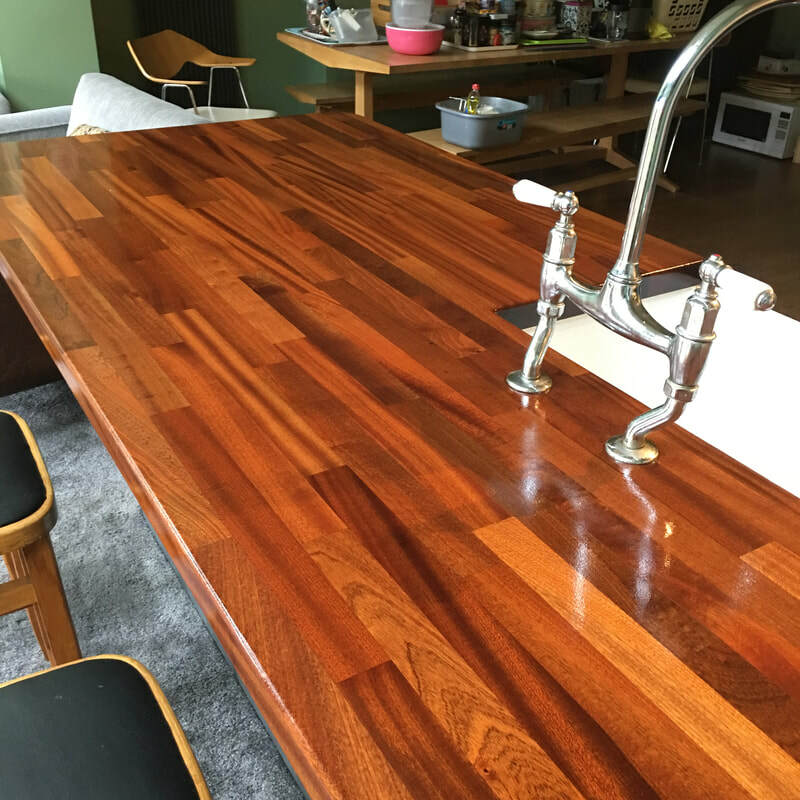 Restoring solid wood kitchen work surfaces takes knowledge and understanding of how timber behaves - it requires the right tools, products and competence to make a professional, long-lasting job of the re-finishing process. A kitchen worktop is often the first thing you look at on entering your kitchen - we can completely transform the original surface and leave a stunning, prominent feature. We have a variety of options available to suit your needs. If you are within the areas listed then we will likely cover your area, in some instances i.e. the areas within Cumbria & Yorkshire that are bordering further counties then we may struggle to reach you. The natural characteristics and charm of timber brings warmth and a certain mellow atmosphere to any kitchen, bar, restaurant or environment. Being a natural product, the elements are brought into the indoor environment and celebrated by thousands of properties worldwide. From traditional country kitchens to modern & contemporary settings, solid wood counter tops have a place in each and will always create a stunning feature. Hardwoods possess significant strength, and are used in a multitude of building applications – they are very tolerant to impacts and will absorb sound when plates / dishes / pots & pans are placed onto them. The cold, sharp sound of a plate hitting a piece of granite is non-existent with natural timber worktops, which adds to the beautiful warmth and glow of a natural hardwood solid kitchen worktop. Timber, by its very nature possesses anti-bacterial properties that repel bacterial from forming. The natural passage of moisture in and out of the timber allows the cell structure to move moisture out of the grain and up to the surface where dry air meets; coupled with our anti-bacterial protective hardwax oils a prefect base is formed for an anti-bacterial work surface. If cared for, real solid wood worktops or counters will last just as long as, if not longer, than any other product on the market. 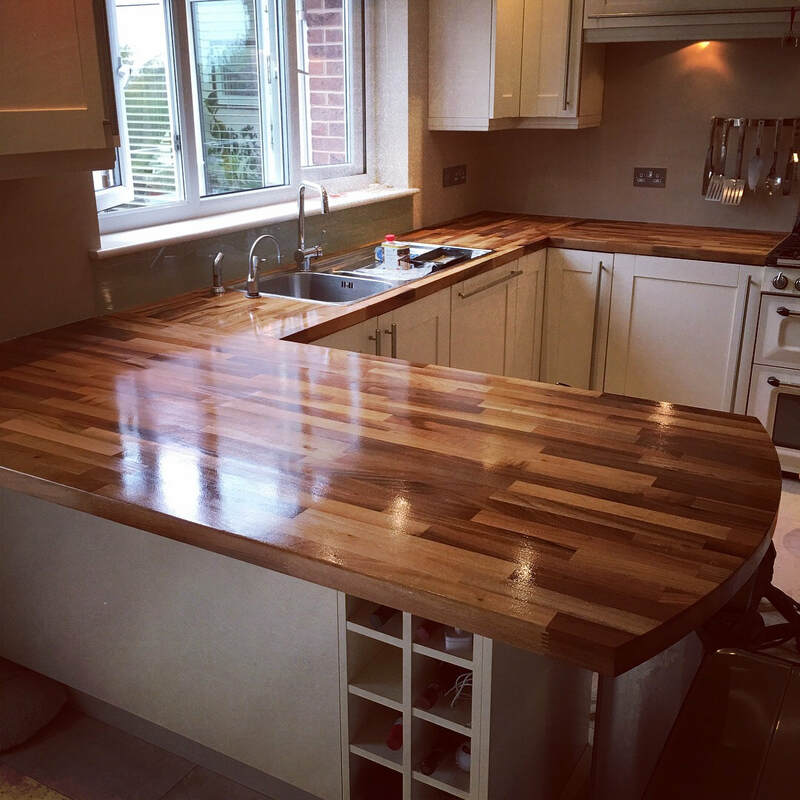 We have treated many timber worktops that are 20+ years old and they still look and feel fantastic. Catch any water damage early, keep on top of maintaining your wooden counters and you will get years of enjoyment from them. Whereas granite is generally black or white, solid wood timber worktops come in a variety of different species and subsequent different shades, textures and characteristics. Each different tree species will provide a slightly different grain pattern which will be seen through the final finish. A clear top coat will offer a matt, satin or gloss finish to the customers liking and can be re-finished at any time to suit the décor of the house / bar / restaurant / office. Each piece of timber worktop is 100% unique – each species grows naturally and forms a grain pattern in the timber that will never be replicated by any other piece of timber – just like a human finger print! This makes your natural wood kitchen counter top truly unique to your property! 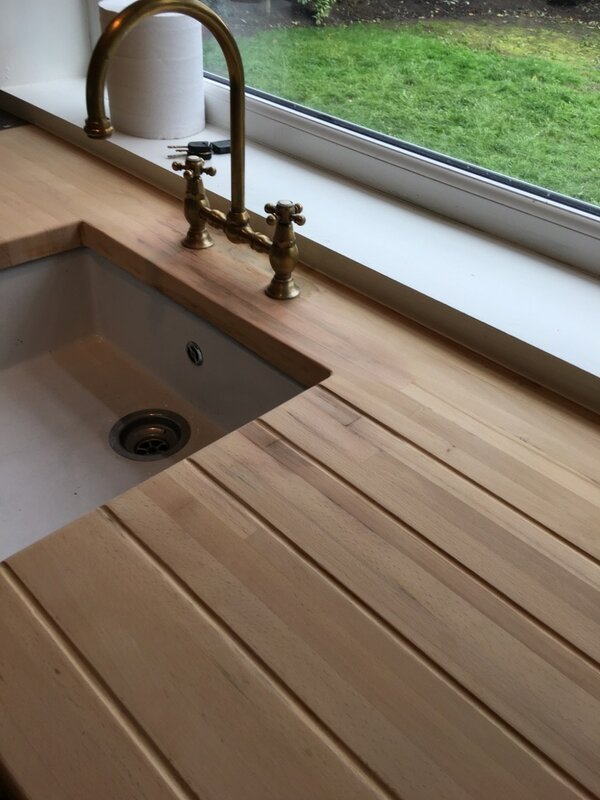 Each piece of timber is cut to length either in a full stave (which runs the length of the worktop, usually with four or five lengths wide), short stave (usually 200-300mm long by 40m wide, blocked, glued and clamped together to form a worktop at a desired length and width) and finally a complete stave worktop. This is one piece of timber which runs the entire length and width of the worktop area. 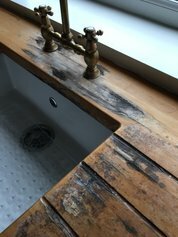 While a wooden worktop is by no means invincible, it will withstand years of wear and tear – if you are unfortunate enough to have a burn mark, water damage or black rings appear then these can all be quite easily dealt with when using our service – bringing the timber back to as new condition. Severe cases of neglect may not always be salvageable, which is why acting fast can save your kitchen worktops. Once we’ve got them back to as new for you, maintenance is straight forward for keeping them looking their best for longer! 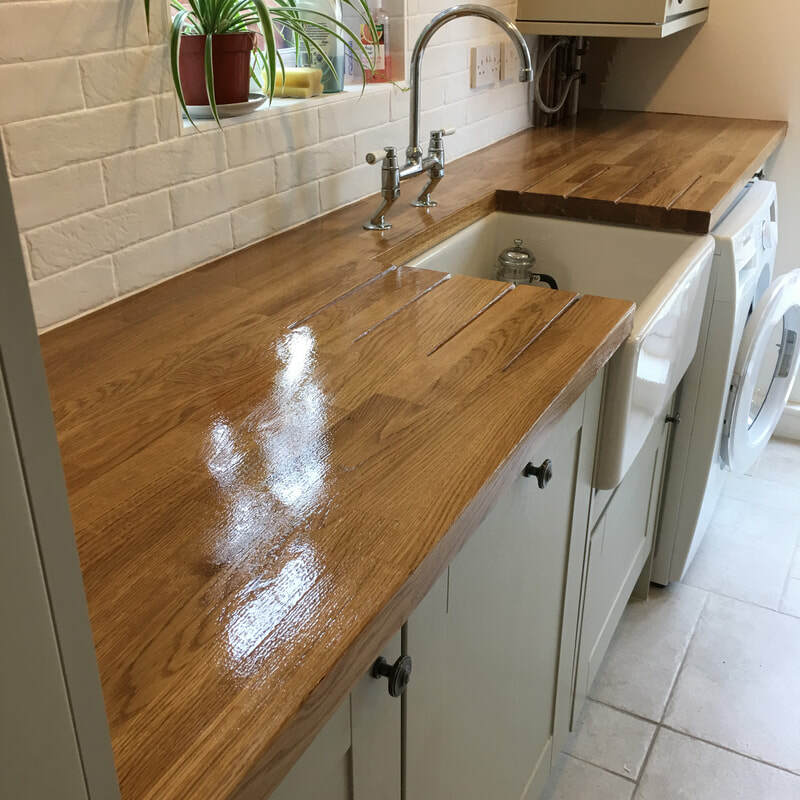 Whatever the interior, a real timber worktop will never look out of place – coupled with the fact that they can be finished to your liking, and then re-finished should you require it at a later date. A real solid wood kitchen counter top is always a good decision. ​Water splashes, cola, beer, wine, tomato-based food products and more will all be repelled successfully with the right protection. Our standard protective coating is Osmo Top Oil – it repels all of the above very well as the oils and waxes sink into the timber, forming a protective barrier. They are not water proof but water repellent – so wiping away water to a ‘dry’ state after use will be sufficient in ensuring water damage does not occur. Furthermore ‘commercial’ products can be applied to re-finished timber to suit the environment and requirements of the client. 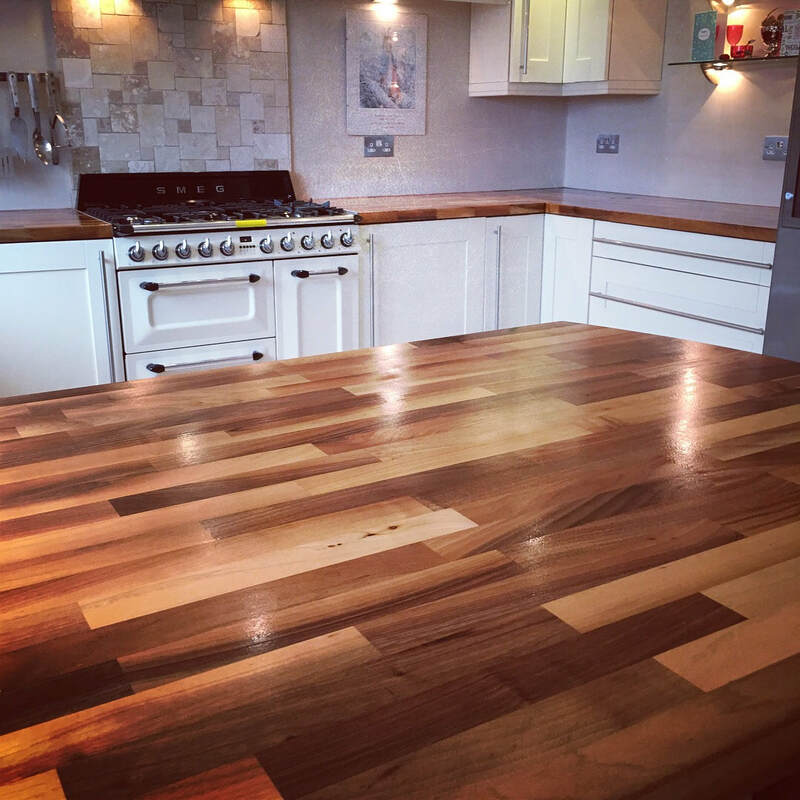 We carry out kitchen worktop renovation and restoration services, delivering professional sanding and oiling across the North West, Cheshire, Wales and the Lake District.